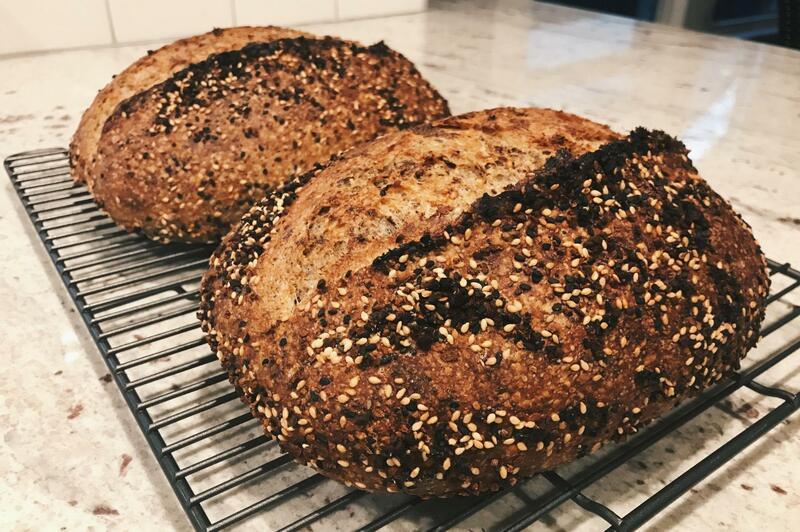 Naturally Leavened seeded sourdough with chia, golden flax, and hemp seeds. Crusted with everything topping. Nutritionally dense and packed with flavor. Mix the chia, hemp, and ground flax seeds together in a vessel large enough to hold them and the water. Heat the water to 210 F and pour over the seeds. Mix together and let stand 1 hr or overnight. Mix flours and germ to combine. Scale the water and pour 10-20 g of it over the scaled salt. Set salt/water aside. Add remaining water to flour and mix to create a shaggy dough. Autolyse 30 min to 1 hr. Add starter to dough and mix to combine. Once the starter is incorporated, add the reserved salt/water mixture. Mix to combine. Mix the dough to develop gluten. I use my kitchen aid stand mixer with the hook on medium speed, takes 6-7 minutes to reach full development. Scale dough, pre-shape and shape as desired, I do two 950g loaves because that's what fits into my combo-cooker dutch ovens. Pre-shape should sit at least 20 minutes before shaping. You can either evenly sprinkle your tea-towel lined banneton with the everything topping or if you make enough roll the whole loaves in the topping before you place into the banneton. Cold proof loaves overnight in the fridge. Next day preheat oven with combo cooker lids (larger part) inside as hot as your oven will go. My goes 550F. Preheat at least 1 hour. When oven is ready take the dough from the fridge, turn it out into the combo cooker base which is lined with parchment or sprinkled with semolina. Slash loaf as desired. Bake covered at 550F for ten minutes. Lower oven temp to 450F and bake additional 15 minutes. Remove lid and bake until desired color is reached and internal temp of loaf is at least 205F. Takes about 5 minutes in my oven. Cool at least 2 hrs before slicing. I am bookmarking this one! You really made something special here! I love it! Thanks so much! I felt it needed to be shared. Lovely bake and recipe! Another bookmark here too.. adding it to my never ending "must try" list.. well done! Thanks! Give it whirl you won't be disappointed! Most seeds per angstrom on a magnificent batard. Monstrous indeed! Monstrous in seed! The crumbs looks custardy and soft! The everything topping is unique and well crafted. Congratulations! Yeah, this one is fantastic. Yeah, this one is fantastic. Would you mind if it was featured on the homepage for a bit? Thank you! Are you kidding me I'd be honored. My first post here, but I've been a long time lurker on the site. I've learned so much here, but finally got the nerve to sign up and post! Very nicely done. Great outside, great crumb. Daring bake! It seems like an everything bagel in a loaf! I am proofing some right now. Added a bit of rye just because it reminded me of everything bagels and that reminds me of New York, and to me New York is Rye bread. Looks amazing. ... now-Mine are still cooling....can't wait! Looks awesome! Thanks for trying out the recipe! I didn't get as much rise from the dough as I would have liked, (that might have been my impatience to eat the bread....)it was pretty dense in terms of crumb (like a bagel!) and was delicious toasted with cream cheese. When I do it again, I will reduce the amount of flax seed, as a lot of it would just not incorporate into the dough no matter what I tried. (I'm also not a huge fan of the taste of flax seed and I felt like it was a little overpowering) Overall it was a great bake though. Cool good to hear! Thanks! So good! Love the crumb. Somehow I manage two 950g loaves following your recipe. But it is definitely a hit in our house! Next bake I will include a touch of honey in the dough. So good! That looks spot on! Of course you got 950g I forgot to account for the weight of the soaker. I'll adjust the recipe. Thanks for trying out the recipe! Great idea on the honey. What are you thinking like 2%? I don’t think 2% (17g) honey would make much of a dent with this size of loaf. I was thinking more like 10% (~100g) maybe. Hello! I'm going to attempt this loaf this week. In an effort to make sure I get maximum oven spring on it, what do you think about me adding 4 tsp of vital wheat gluten to give it an extra 'umpf'? I wouldn't, I think that ingredient would only serve to toughen the crumb. Plenty of gluten in the recipe if you use bread flour. Hello, I've just added the seed soaker during a stretch and fold and something seems off. The soaker is slippery and doesn't seem to want to incorporate into the dough much during the S&Fs. If there a secret to incorporating them? The soaker and dough are almost akin to water and oil right now. I hope it came out OK! The seeds can be a little challenging to incorporate. I usually "dot" little piles onto the dough and then "rub" it in, then fold the dough and repeat the process. Ahh, that's a great idea. I just dumped the whole soaker in. Anyway, I let it bulk in the fridge and will let it proof later today and let you know. I'm a new sourdough baker and I have a few questions, I've had 3 successful bakes prior with a very simple recipe, this was my first attempt at something more adventurous. I followed the recipe exactly (or so I think), and the center of my loaves turned out very under cooked. You don't mention a final proof so you go straight from the fridge to the oven correct? Also is your oven a convection oven, I used just the regular bake setting when the other recipe I've used call for convection. I baked with the lid off for 15 minutes to get the desired crust browning I was looking for, so I didn't think to check the internal temperature. The bread is still very good after toasting to cook the center lol So I guess I am looking for some suggestions, should I do a final proof? Use convection setting? Thanks! Do you have an oven thermometer in your oven? It's important to start these as high a temp as possible (550 with steam or dutch oven lid on) to get a good spring, and finishing out the bake around 475. If the crust sets too fast the center will take longer to bring up to temp. If you can check the internal temperature with a probe, make sure it's above 205 F before you pull it out of the oven. I have found that these bake fantastic with a room temp proof and bake after shaping, as opposed to the cold overnight proof int the fridge mentioned in the recipe. Hope this helps! Thanks for sharing. I made my loaves smaller (650 g) and proved in fridge for 32 hours. I sprayed the loaves before placing onto my stone in order to help prevent the seeds from burning (it was successful). The loaves were quite flat when they went into the oven but they surprised me when I came back 15 minutes later - the oven spring was amazing. I turned off the oven and left the loaves in the oven for 5 more minutes even after the internal temperature was 210 - the crust was a bit too soft (maybe because of the external spraying?). Really a nice loaf in look and in flavor! Was a master stroke. I give the loaves a good soak before slashing and the onion and garlic stay a nice deep golden brown instead of burning. Pic on Insta Thanks for sharing this, it has helped take my Seed Monster bakes to the next level. This is why recipes and techniques should be shared openly! Great community here. I have a bag of neglected flax seeds in my cupboard that are whole, not ground, and I don't have a mill. Can you soak whole flax seeds and they'll be digestable? or a bullet, or even a food processor? I use a bullet to grind my flax seeds. Even a blender would help nick the seed coats of the flax to allow access to the nutrients. I don’t know if soaking helps. My oven only heats to 500 degrees. What do you suggest since you start your bake at 550 degrees? has anybody tried halving the recipe? Two loaves are too many for my household.